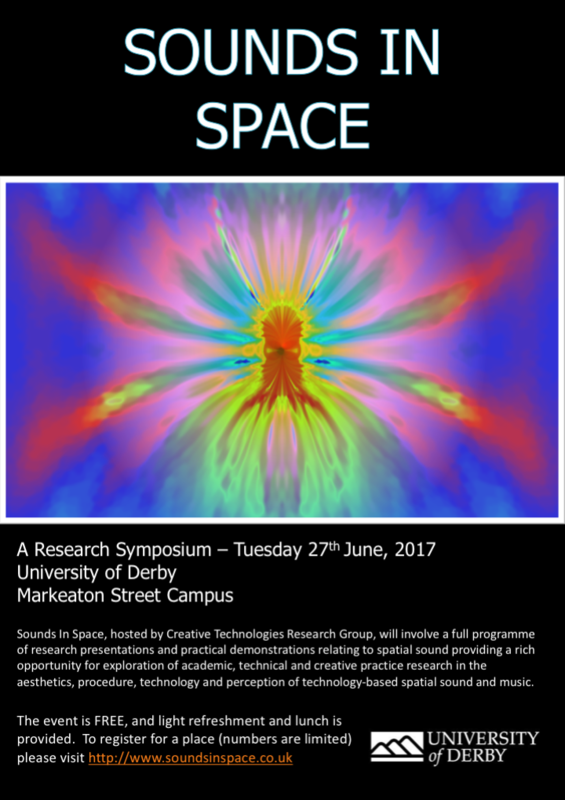 Sounds in Space 2017 is now over, but we’ve got videos and accompanying PDFs of each of the talks to share. Comments always welcome. Please note that Jimi Hendrix’s Voodoo Chile broke the stream during John Leonard’s keynote (facebook canned the stream once it noticed! ), and when the stream was restarted (YouTube only!) there is some audio glitching for a little while…..our apologies for this unforeseen hiccup – the 2nd stream restart fixed it! Call for Works now closed – please see details in the Call for Works section later in the page. Keynote Announced – We’re pleased to announce that John Leonard, the theatre sound design guru, will be providing the keynote for this year’s event 🙂 See below for more details. 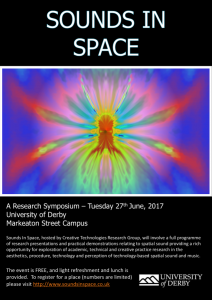 Sounds In Space, hosted by Creative Technologies Research Cluster, will involve a full programme of research presentations and practical demonstrations relating to spatial sound providing a rich opportunity for exploration of academic, technical and creative practice research in the aesthetics, procedure, technology and perception of technology-based spatial sound and music using the facilities of the Markeaton Street Campus of the University of Derby. 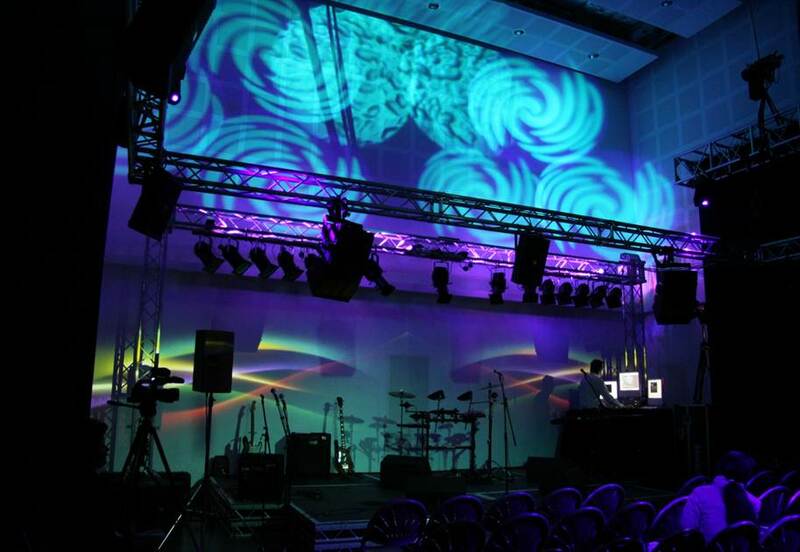 The day features a 28 speaker with-height Ambisonic Speaker Array in the main presentation room, as well as a Sonic Emotion Wave 1 Wavefield Synthesis Array. John Leonard started working in theatre sound in 1971 for The Bristol Old Vic Theatre Company, moving to The Royal Shakespeare Company in 1978. After ten years, during which he was made head of sound and an Associate Artist he left the RSC to pursue a freelance career, with which he continued with great success, eventually forming a partnership with other like-minded designers under the banner of Aura Sound Design. During this period, he became sound associate for The Almeida Theatre, received an honorary fellowship from The Guildhall School Of Music & Drama, for which he is a visiting professor of Theatre Sound, won a Drama Desk award, a Sound Designer Of The Year award and wrote an acclaimed textbook on theatre sound which is now in preparation for its second edition and contributed to other books, journals and radio programs. With his associates in Aura, he designed sound systems for The Almeida Theatre at all of its temporary homes and for the refurbished theatre in Islington, for the new Hampstead Theatre in London, and exhibition installations for Madame Tussauds at Warwick Castle, Amsterdam and New York. Since 2005, he has been back in the freelance world, working in the West-End, on Broadway and in theatres throughout the UK. His interest in surround started in the early-1970s and hasn’t diminished since then. 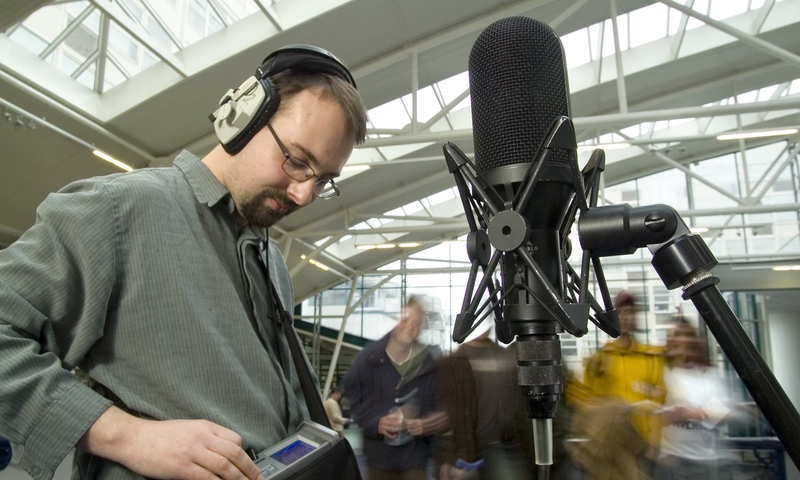 He records many sound effects for his library using a Soundfield ST450 and a Sound Devices 788T. If you’re interested in demonstrating your work (research, case study, surround sound/VR installation/composition etc), then please see the call and further details PDF below. The event is a relaxed and stimulating one with time for networking/questions and discussion. Feedback on previous years symposia has been excellent, and there’s always a great mix of theory and practise with a focus on demonstrations and examples during the day using the 32 speaker 3D array installed in the presentation room for the event.